OK, so today is a cheat in that I actually did the print yesterday - but I had the ink out for the linocut and really wanted to experiment a bit more - that's what it's all about, right? 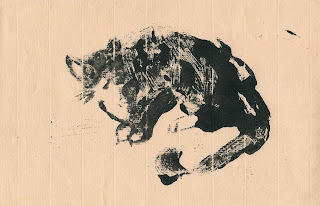 Sadly my experiments didn't go very well - there clearly is some kind of trick to doing monoprints, either that or the ink I've got is just too cheap - it was drying out before I had finished drawing. Also the charcoal paper I used was probably not the best thing as the lines on it have come through clearly. Again, more research needed - this is one of the reasons I like doing the 28 drawings later challenge - it gives me so many ideas to explore until the next one!